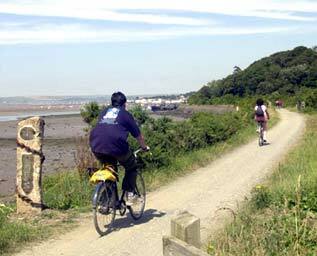 Isley Marsh is a RSPB Nature Reserve and can be reached from the Tarka Trail. There is a footpath around the western edge of the marsh providing the best views over the river and the marsh, this also allows views over the more interesting areas of the ashbeds, including some small areas of carr and freshwater wetland. For bird watchers the best time to visit Isley Marsh is one to two hours before high water this will enable the observer to watch the tide pushing the feeding ducks and waders out of the deep creeks and onto the open water and roosting areas. There are many breeds of birds found on the marsh during different times of the year. Summer Birds – Warbler, Skylark, Kingfisher, Barn Owl, Swallow, House Martin, Swan, Coot and Moorhen. Lower Yelland Farm is split in two by the Tarka Trail which is part of the Sout West Coastal Footpath and residence often choose to take the short walk from the farm to Instow for their evening meal. We have bikes on the farm which can be hired to residents, however if not a resident then a large variety of bikes can be hired from Fremington Quay and from there you can ride along the Tarka Trail towards Instow, Bideford, Torrington and then to Meeth or in the other direction towards Barnstaple and then along the other side of the estuary towards Braunton. There are many place to stop and take in the views as well as cafes and restaurants for those important pitstops to refuel! !